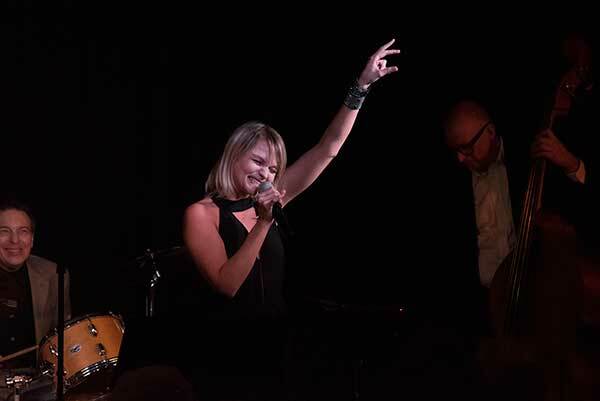 Photos by Bruce Landis: Erin Boheme, a nationally acclaimed jazz singer from Nashville, will make her second appearance in Albion on Aug. 25 and 26, accompanied by the Dave Mancini Trio, with a local high school barbershop quartet opening. ALBION – Amy Sidari has a hard time containing her excitement when she talks about her luck in booking a nationally acclaimed jazz singer at her Cabaret at Studio B.
Erin Boheme’s first visit to Albion last year was the result of a chance conversation between Sidari and Albion High School music director Gary Simboli. Sidari had asked Simboli about ideas for a new kind of entertainment at her Cabaret. They had never had jazz, and Simboli suggested having Dave Mancini and his trio, but warned Sidari that Mancini was not easy to reach. Sidari did contact him but was told he was very busy composing. She asked if he would consider it at a different time, but his answer was the same. Boheme’s record producer is Michael Buble, and she was chosen to sing at President Trump’s inauguration. Dave Mancini will be back in Albion performing with Boheme on Aug. 25-26. Sidari was quick to point out to Boheme that she was trying to bring top notch entertainment to Orleans County, but wouldn’t be able to charge top dollar because it wasn’t an affluent community. Boheme said she had a very good feeling about their conversation and they would make it work for both of them. Boheme and the Mancini Trio performed to a full house last Aug. 26. They will be back for two shows this time, on Aug. 25-26. Boheme stayed at the Sidari home during her visit and partied with the local community at Tillman’s Historic Village Inn after her performance. She knew immediately she would be back to Albion. Boheme is a native of Oshkosh, Wis. She has liked to sing since she was a little girl. Her school offered a jazz choir as an extracurricular activity, and students had to audition to get into it. Boheme was the first freshman to be selected for the choir. She got her first big break at 17 when she appeared on Star Search, the forerunner of America’s Got Talent. She tied with another singer, but the three judges chose the other contestant as the winner. Boheme doesn’t consider she lost, because producer of the show was the man who would later become her husband. Boheme has always liked jazz, and said she grew up listening to Sinatra. But she also loves R&B and blues. She said being asked to sing at the President’s inauguration was due to a polarizing situation. She is also fortunate to have Michael Buble as her producer. Her second album which he helped produce sold out. Many of the songs were recorded at Buble’s home in Vancouver, and his touring band accompanied her, she said. Sidari agreed Mancini is an amazing musician. Boheme said Sidari has a “beautiful heart and has created a beautiful environment” with her Cabaret. “It is a real honor for us to be able to come into that,” Boheme said. 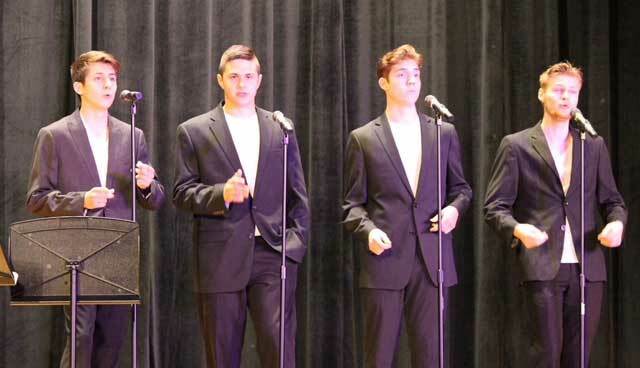 Provided photo: A barbershop quartet from Albion High School will open for Boheme at both Cabaret concerts. 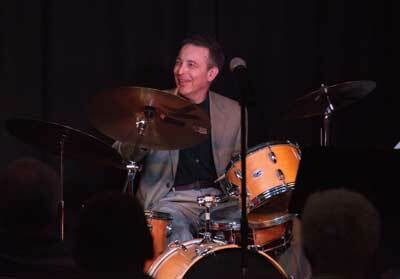 The quartet is called “The Billies” and includes Nate Grammatico, Evan VanAmeron, Jacob Ettinger and Enoch Martin. Sidari will also welcome Boheme and her agent Barb Bailey into her home during their stay in Albion. “Barb and I have also become friends, and will meet for the first time,” Sidari said. Boheme said Sidari’s home is one of her favorite places to stay in all her travels. Having grown up in Oshkosh, home of the world’s biggest warbird show, Boheme said she looks forward to sharing airshow stories with Sidari’s dad, Ace Caldwell, a pilot and member of Pine Hill Airport. The entertainers this year will attend a picnic on Saturday, given by Jim Salmon, host of the Home Repair Clinic on WHAM 1180. Boheme has also agreed to sing during the 10 a.m. church service on Aug. 26 at the Albion First Baptist, the corner of Liberty and West Park Street. Tickets for the Cabaret concerts with Boheme are $25. Call Sidari at (585) 354-2320 or click here for more information.